Ever since I started teaching women about hypnobirthing, I get a lot of questions about natural birthing methods. Understandably, many parents today are not aware of the significance and benefits a natural birth can give. Our upbringing dictates that the safest way is to use regular hospital methods. 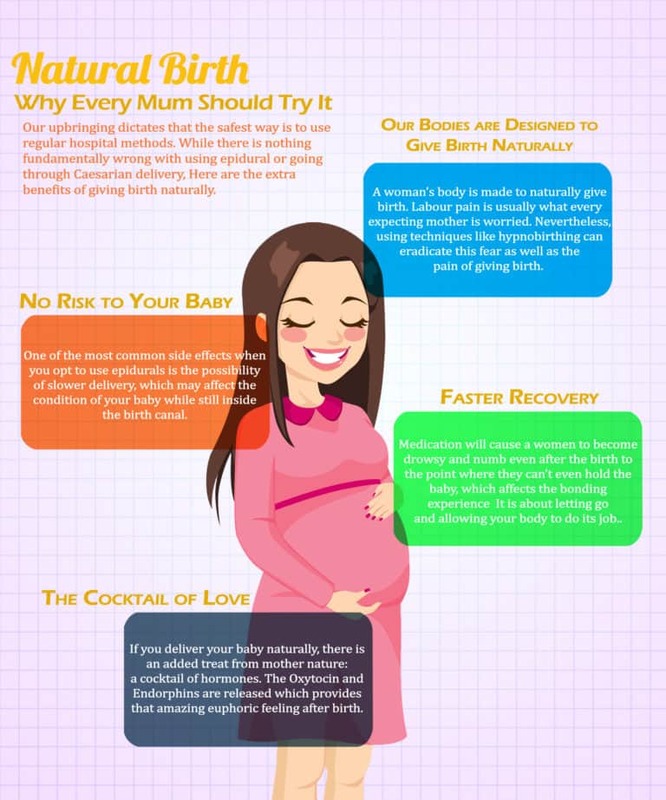 While there is nothing fundamentally wrong with using epidural or going through Caesarian delivery, I am sharing the extra benefits of giving birth naturally. A woman’s body is made to naturally give birth. It is designed to produce one of the most powerful natural pain relievers during childbirth. Labour pain is usually what every expecting mother is worried about. Nevertheless, using hypnobirthing techniques can eradicate this fear as well as the pain of giving birth. As there are many potential side effects of using pain relief medications during delivery, some mothers are concerned over the effect of drugs on their babies. Since natural childbirth does not use any invasive tool, there is little or no potential harm both for you and your baby. One of the most common side effects when you opt to use epidurals is the possibility of slower delivery, which may affect the condition of your baby while still inside the birth canal. Our upbringing dictates that the safest way to give birth is through the use of regular hospital methods. While there’s nothing wrong with using an epidural or a Caesarian delivery, there are extra benefits when you give birth naturally. Women’s body are designed to give birth naturally, it is designed to produce one of the most powerful and natural pain reliever during childbirth. Using Hypnobirthing Techniques can eradicate the fear of giving birth. I f you want to learn more natural birthing method, research or go to Hypnobirthing Hub. Learning is important to have a safe and healthy birth. My personal experience with natural birthing is that I am amazed at the speed of my recovery. I remember walking to the shower just an hour after giving birth to my twins, thinking how easy this was. I felt fantastic and really proud of this amazing achievement. I think the best thing was knowing that I trusted in my body to do what it was already meant to do. It is about letting go and allowing your body to do its job. Sadly, using medication will cause a women to become drowsy and numb even after the birth to the point where they can’t even hold the baby, which affects the bonding experience . If pethadine is used late in birthing, your baby will routinely be taken to the intensive care unit for many hours for monitoring. Obviously, this can be rather distressing for the mother and baby for this time. If you deliver your baby naturally, there is an added treat from mother nature: a cocktail of hormones. In the mix is an extra dose of oxytocin, the ‘love hormone’, which makes you fall even deeper in love with your baby. Following that is a splash of endorphins; these are happy hormones that naturally calm the body. To top it off, there will be a few more feel-good hormones added to the mix. This wonderful combination provides that amazing euphoric feeling after the birth. Research suggests that women who use medication produce much less of these hormones than those who choose to give birth naturally. These days I am happy that many women out there are ready and willing to try natural birthing. It is one of the safest and most uncomplicated ways to give birth. I often share my experience with mothers-to-be because I value the experience that I have had when I gave birth to my children. If you want to know more about hypnobirthing and other natural birthing method, research and learn. Learning is your bestfriend when it comes to having a safe and healthy birth.